Virgin Galactic is one of two companies, along with Blue Origin, on its way to sending passengers into space—though just barely, and just for a few minutes. According to Branson, the SpaceShipTwo's next test flight is planned for February 20, depending on weather conditions. Yeah, but Branson ain't even gonna orbit. So who cares? Musk is going to f'ing Mars! His *car* is in orbit. Let's hope he stays there. Whatever it take to get the public comfortable with not only the technical feasibility, but also the economic feasibility of working in and outside of earth orbit. We need to start harvesting dem asteroids and comets. Just out of curiosity has anyone done any studies on modeling the effect of potential human activity in the asteroid belt? We went willy nilly on harvesting Earth, lets at least ponder the various consequences of our activities in the greater system. Musk got handed technology and several billion dollars in contracts from NASA to shoot stuff into space in an effort to show that NASA is transferring technology to "private" companies, and that the whole space program isn't just an aimless boondoggle, and therefore deserves continued and increased public funding. Branson does what he does with his own money. I am with Jayarava on this. Branson put a lot of PR to define how much air pressure there should be to classify his flight as space flights. That is, to make his low hop flights to be considered as 'space flights' for paying customers, so they can place the plaque certifying that on their walls (or wherever). Why bother? Branson is in 'space' on his yacht as well. Just 'space' with more air. "The companies want to send hundreds or thousands of people on these short "suborbital" flights, meaning they wouldn't get high enough to orbit the earth." That's not what "suborbital" means. Musk got handed technology and several billion dollars in contracts from NASA to shoot stuff into space in an effort to show that NASA is transferring technology to "private" companies, and that the whole space program isn't just an aimless boondoggle, and therefore deserves continued and increased public funding.y. SpaceX got contracts because they had a working booster at the time. Musk changed the way that NASA contracted out (from cost plus to competitive fixed price) to make the whole thing cheaper and more efficient. Good luck Richard and happy landings! Jayarava, over time you will notice that Eikka is very selective with his "facts". Every so often he manages to get one or two right, but then even a blind squirrel finds a nut every now and again, and a stopped clock is right twice daily. Branson & Musk. The utube viewings, watching them puking their guts out, should achieve historical numbers. Now that's advertising you can't buy! "Oh, such memories... Let the good times roll!" Turing, there are several articles on Wiki about mining the asteroid belt. & if you browser the subject probably a lot more. Plus a whole lot of penny-stock entrepreneurs trying to wheedle you into looking at their prospectus! If they had a real product? Would they need your few bucks? At our present level of technology? We can just begin yo consider catching & branding the rocks in Earth orbit or passing close by. Jeep in mind, the asteroids are only valuable if kept in Space. Used in Space. Bring a million Kgs of gold down to Earth? Wouldn't be worth a wooden nickel. The really valuable rocks will be containing carbon & phosphates & ices. But only in Space! Using EFT you could sell rights to gold kept in orbit. Uh you gotta source for this? Mother Jones maybe? 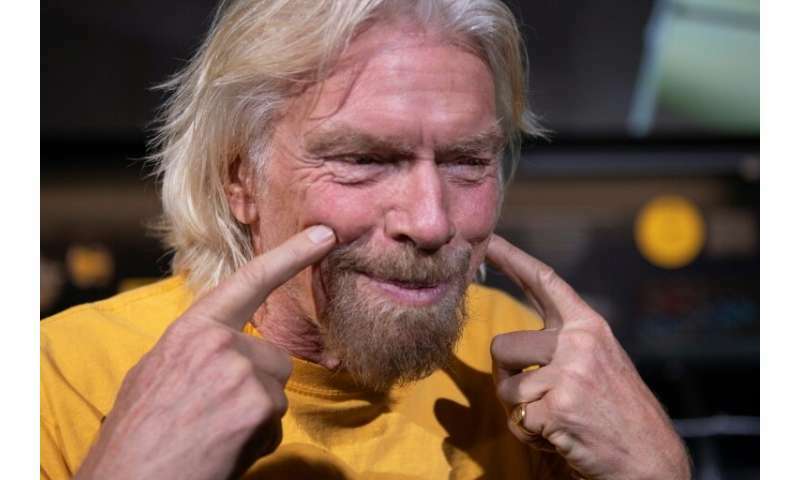 Branson's really old so what's he got to lose? Look at the picture - he even has to use his fingers to smile. Branson, Musk and Bezos should combine programs and all go up at once. Tritium comes to mind as being worth mining from the asteroid belt, given today's prices per ounce. Also consider all the resources we'll just plain run out of on the earth, and very soon. For example, there isn't enough lithium on the planet for 7 billion laptops and 7 billion electric cars. . .